McClain’s is proud to introduce another sharpening service! Daniel Jasa of McClain’s has taken an active interest in the craft of tool sharpening and will sharpen carving tools including ones purchased from McClain’s. 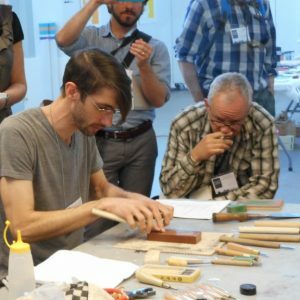 In addition to this service, Daniel also offers sharpening workshops in the Portland, Oregon area where he demonstrates proper techniques for sharpening and maintaining wood carving tools with Japanese ceramic and natural whetstones (toishi) as well as with a motorized sharpener. His next workshop is coming up on December 18th from 5:30 to 9:00pm at Atelier Meridian in Portland, Oregon. To contact Daniel about his tool sharpening service email him at danieljasa[at]gmail.com, call (503)929-1188, or follow him on Instagram @danieljasa . Resingrave now has an informational website full of tips, advice and general how-to’s on working with Resingrave. Resingrave is a synthetic medium composed of super hard epoxy resin mixed with an opaque white filler that delivers wonderful, detailed results. Invented in the early 1990’s by engraving artist and retired research biochemist Richard Woodman, Resingrave was developed as a quality, accessible and affordable alternative medium to the traditional end-grain boxwood. Resingrave is available in 13/16” thick blocks or thinner 3/16” plates. The Holidays are here and McClain’s has added some treats to our sale page! This year we are featuring 10% off Mica, the powder that will give your prints a holiday sparkle, and six-packs of 4”x6” Shina blocks, the perfect size for holiday cards. 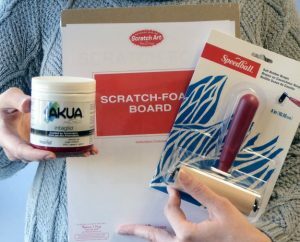 We are also offering a kid-friendly printmaking kit that includes a 4” Speedball brayer, ScratchFoam in packs of 12 and your choice of Phthalo Green or Crimson Red Akua Intaglio. Visit the McClain’s Sale Page to view these deals and more! Wishing you all a wonderful, safe and creative holiday season! Happy Holidays!